Since those early days analyzing financial offers I’ve learned to pick up on multiple methods financial charlatans use to obfuscate what’s really going on. I’ve studied to be a magician. I’ve learned to read micro expressions. And I’ve worked in computer security where you have to learn to think like a criminal. Sometimes the clues are very small and writing about them seems too trivial for a blog post. Recently I received one as a comment on one of our blog posts and it was so blatant that I thought it would be a nice introduction to scams for the uninitiated. The offer is clearly too good to be true. They have put all the term investors who don’t know any better might be looking for. If you want to look for really bad investment ideas just do a search for “Guaranteed Profit” in google and see what suggestions you find. In the investment world, there is what is called the “risk-free return” in theory. The closest approximate we have are very very short term Treasury bonds. This risk-free rate is very low. It is about what you get on your FDIC insured bank account. Any higher return will include taking some risk, and that risk means they can’t guarantee the return of your principal, let alone a profit. There is also an expected return. The expected return of the equity (stock) markets is around 6.5% over inflation. If inflation runs at 4.5% this would make the expected return of the equity markets about 11%. The equity markets are inherently volatile. Any expected return over 11% means you have something which is even more volatile than the average equity market. The expected return of the highest returning subsets of the equity markets may reach as high as 18% at times. But they are extremely volatile and should receive only a small fraction of your portfolio’s value. They are so volatile that losing 50% of their value can be a regular occurrence. Any expected return above the normal equity market return is suspect and should be taken as the first red flag. 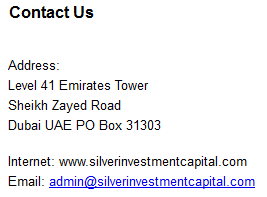 I visited the website of “Silver Investment Capital” and learned that there is no phone number and their offices are supposedly in Dubai. Any information you receive from a financial organization outside the United States is probably a scam. United States financial compliance regulations are so onerous that most foreign financial institutions can’t or won’t comply. And even if they are partially legitimate, what will you do when you send them your money and then don’t hear anything? Visit Dubai? And if you visited this address in Dubai, what do you think you would find? I did a google search of this address and here are some of the businesses which are supposedly here: Arton Captial, Van De Bunt Parners FZE, Fast Lane Startup, Dubai Online Shopping, Group Talafone, Reesmarx, United Alliance, Innovation 360 Institute, Icon Gold, Cadmus International, Ding Li, Armstrong International Limited, Darwin Rhosde Limited, and the i360PlayCamp. I suspect all of those organizations and scam operations preying on the unsuspecting. 1.3. Client deposits money using Liberty Reserve, Perfect Money or Alert Pay e-currency. These are very difficult to trace. We also accept Bitcoin which is also untraceable. In other words, don’t share this with the authorities. They will make us buy a new URL and start over. We can’t scam you unless you give us all your personal information. If our website does get shut down. Don’t worry enough to do anything just in case there is anything you can do. 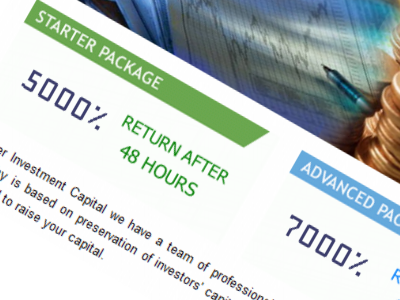 Also don’t worry that we are pretending to be an investment firm that handles millions of dollars and yet can’t seem to get the apostrophe-s correct on our website. 5.1. Once investment term has reached maturity, total profit together with client’s principal investment will be sent automatically into e-currency account. Don’t worry, we promise before you invest that you can get all your money at any time. 6.1 Silver Investment Capital pays a life-long affiliate commission equaling 10% of all amounts invested by every affiliated client. Please tell your friends. They trust you more than they should trust us. Anything you are worried about, we guarantee that won’t happen with the exception of the electronic payments system so that we can blame the payment system and tell you to contact them, if you hear from us at all. Well, actually we would be subject if we were real and you lived in the United States, but we have lied so much already let’s just keep going. 10.3. 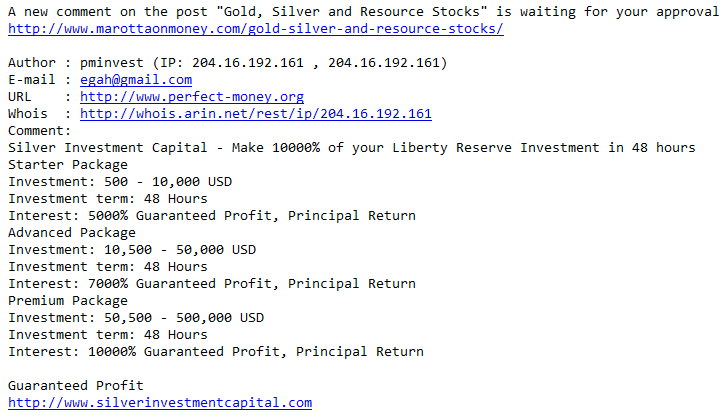 You may not modify, copy, publish, display, transmit, adapt or in any way exploit the content of Silver Investment Capital website. Only if you obtain prior written consent from us – and from all other entities with an interest in the relevant intellectual property – you may publish, display or commercially exploit any material from Silver Investment Capital. To seek our permission, you may contact us. We would not like it if a real financial advisor used the contents of our site as a negative example in a blog post entitled “Anatomy of a Scam.” We hope this paragraph makes him hesitate before publishing. Unfortunately if he is smart he will recognize that Silver Investment Capital can’t sue him because it doesn’t exist. And if it did exist, he couldn’t be sued for defamation because everything he says about us is, unfortunately, true.